At the invitation of the governments of Russia, Estonia, Slovenia, Albania and Kazakhstan, from April 11 to 19, Vice Premier Zhang Gaoli of the State Council will travel to Russia for the fourth meeting of the China-Russia Investment Cooperation Committee, and the co-chairs' meeting of the China-Russia Energy Cooperation Committee, visit Estonia, Slovenia and Albania, and attend the eighth meeting of the China-Kazakhstan Cooperation Committee in Kazakhstan. Q: According to Indian media reports, the Dalai Lama is visiting the disputed eastern section of the China-India boundary at the invitation of the government of the so-called "Arunachal Pradesh". What is China's comment on that? A: In disregard of China's concerns, the Indian side insists on inviting the Dalai Lama for activities in the disputed eastern section of the China-India boundary. It severely hurts China's interests and the China-India relationship. Firmly opposed to that, the Chinese side will lodge stern representations with the Indian side. The Chinese side holds a consistent and clear position on the eastern section of the China-India boundary. The Indian side knows well the role of the 14th Dalai Lama. Arranging his activities in this sensitive area where China and India have territorial disputes not only violates India's commitment on Tibet-related issues, but also fuels the border dispute. It runs counter to the sound momentum of the development of bilateral relations and will do no good to the Indian side. The Chinese side will take necessary means to defend its territorial sovereignty and legitimate rights and interests. We call on the Indian side to immediately stop its erroneous move of using the Dalai Lama to undermine China's interests, refrain from hyping up sensitive issues between the two sides and undercutting the foundation for boundary negotiation and bilateral relations, and take concrete actions to safeguard the overall interests of the bilateral relations. Q: Syrian President Bashar Assad knows that China and Russia will wield veto power at the UN Security Council. We have seen another chemical attack in Syria recently, should we expect another veto today at the Security Council? A: The Chinese side has noted the report about a suspected chemical attack in Syria. 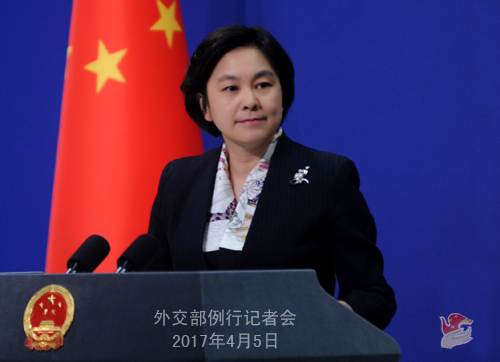 China's position on chemical weapons is consistent and clear. We are against the use of chemical weapons by anyone under any conditions for any purposes, and we condemn, in particular, the use of chemical weapons against innocent civilians. The issue of chemical weapons in Syria bears on the international non-proliferation regime and the political settlement of the Syrian issue. We call for objective and impartial investigation into the attack so as to identify those behind the attack based on solid evidence. Q: With regard to what you said about Dalai Lama's visit, the Indian side said that no color should be added to this particular issue. An Indian minister stated that the "Arunachal Pradesh" is an integral part of India. The issue between India and China, as far as the border dispute is concerned, is about the line of actual control. China should not interfere in India's domestic affairs. What is your reaction? A: It is without any doubt that China upholds the principle of not interfering in others' domestic affairs. And China's stance on the eastern section of the China-India boundary is also clear-cut. India's insistence on arranging the Dalai Lama's visit to the disputed eastern section of the China-India boundary has gone beyond the scope of domestic affairs. We are all clear about who the Dalai Lama is and what role he plays. As I said, by inviting the Dalai Lama for activities in the sensitive area where China and India have territorial disputes, the Indian side has violated its commitment on Tibet-related issues, and escalated the boundary dispute. We call on the Indian side to stop its erroneous act of using the Dalai Lama to undermine China's interests. Follow-up: The Indian official said it is a purely religious visit by the Dalai Lama, and he has visited this place 6 times earlier, and nothing particular significant should be attached to this. What is your comment on that? A: We have noted the statement by the Indian official. But may I ask, do you really believe that the Dalai Lama is a purely religious figure? The answer is obvious. Since the Dalai Lama is not a purely religious figure, how can we say that his activities in the sensitive disputed area are for religious purposes only and nothing else? I believe you are all clear-headed on this and can see through all the arguments. We hope that the Indian side will respect China's interests and concerns on this issue, and stop using the Dalai Lama to undermine China's interests. Q: First, the DPRK fired another missile today. US President Trump called the DPRK a "humanity problem". What is your comment on that? Second, there is such a viewpoint in the US that if China is not going to solve the issue of the DPRK, the US will. How do you respond to that? Third, US senators proposed to address Chinese opposition to the deployment of THAAD on the Korean Peninsula. What is your comment on that? A: On your first question, the Chinese side has noted the relevant report. Relevant Security Council resolutions have explicit terms about the DPRK's launches using ballistic missile technologies. Under the current circumstances, relevant parties should exercise restraint and avoid heightening regional tensions. On your second question, China has made tremendous efforts and played an important role in resolving the issue of the Korean Peninsula. To fundamentally resolve a deep-seated issue as such, we should adopt a holistic approach that can address both the symptoms and the root cause and accommodate all parties' legitimate concerns in a balanced way. The Chinese side is willing to work together with all parties to denuclearize the Peninsula and realize long-lasting peace and stability in the region. On your third question, the Chinese side's consistent and firm opposition to the deployment of THAAD by the US in the ROK remains unchanged. It is hoped that the ROK side will take seriously China's legitimate security concerns and call off the deployment. Q: Do you think that the launch of the missile will affect the meeting between President Trump and President Xi Jinping? A: I cannot see the connection between these two things. I have made clear our position on the DPRK's launches of ballistic missiles. 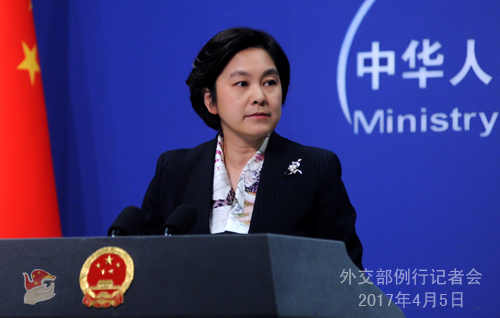 With regard to the China-US presidential meeting, Vice Foreign Minister Zheng Zeguang has briefed the press from home and abroad about China's expectation for the meeting at the briefing on March 31. The meeting is of great significance in charting the course for the development of China-US relations in the new era, pushing for the sound and steady growth of the bilateral relationship from a new starting point and promoting peace, stability and prosperity in the Asia-Pacific and beyond. The two sides will have in-depth exchange of views on the bilateral relationship and major international issues of shared concern, in a bid to increase mutual understanding, strengthen bilateral cooperation, enhance bilateral exchanges and lay down a blueprint for the development of the relationship. Both sides attach great importance to the upcoming presidential meeting. The Chinese side will stay in touch with the US side to press ahead with the preparation work and ensure the success of the meeting. Q: The Japanese Cabinet reportedly adopted a policy, which will allow the usage of the Imperial Rescript on Education as a teaching material if it is used in line with the constitution and the education law. In addition, Japan's education authorities have decided to introduce militaristic bayonet classes to its physical education programs, which has met wide criticism. What is your comment on that? Are you worried about Japan's moves on history issues? A: We have noted the relevant report. The war of aggression waged by the Japanese militarism during the modern times brought untold sufferings to people from China and other Asian countries, and also led Japan to a complete failure. There are hard lessons to learn from the history. But now the Japanese side attempts to restore the war-time education philosophy and training programs, we cannot help but ask whether Japan is rolling back the wheel of history and taking the same disastrous road of war. Japan's moves have aroused the attention of peace-loving people inside and outside of Japan. The Japanese side should face up to and reflect upon history, draw upon historical lessons, make a clean break with the past of aggression, and stop misleading the public with a wrong outlook on history, so as not to divert Japan once again into the dangerous course of militarism. Q: Has the Chinese side lodged representations with the DPRK about its launch of missile? 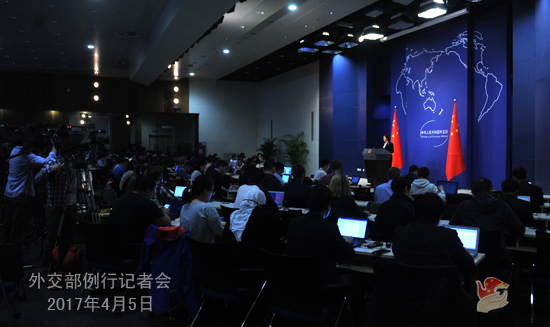 A: All parties are fully aware of China's position on the relevant issue, which is open and clear. Q: You mentioned in your reply that Dalai Lama's visit would escalate a border dispute between India and China. In what sense will it escalate the dispute? What measures is China likely to take as you said that India went ahead with the visit in disregard of China's concerns. In terms of lodging representations with the Indian side, has it been conveyed to the Indian ambassador to Beijing? 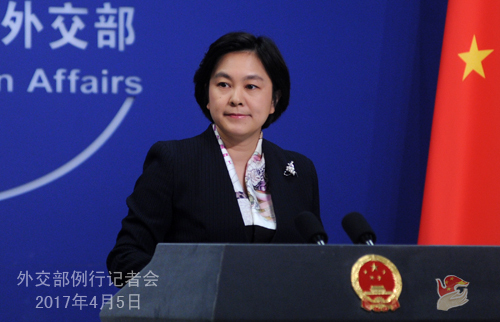 A: I would like to reiterate that Tibet-related issues bear on China's core interests. The Chinese side holds a consistent and clear position on the eastern section of the China-India boundary. In disregard of China's concerns and representations, the Indian side insists on arranging the Dalai Lama's visit to the disputed part of China-India boundary. It certainly will hurt China's interests and the China-India relationship, and will bring nothing good to the Indian side. We ask the Indian side to stop using the Dalai Lama to undermine China's interests. We also hope that the Indian side will not hype up sensitive issues between the two countries, but take solid steps to safeguard the overall interests of the bilateral relationship. We have said multiple times before that a sound and stable relationship between China and India, who are close neighbors and major Asian countries, is in the interests of not only the two countries, but also stability and prosperity of the whole region. We hope to maintain the sound momentum of bilateral relations, but it requires the joint efforts of both sides. The Chinese side will lodge solemn representations with the Indian side about this. Q: Will President Xi and President Trump touch upon Middle East affairs? What will they talk about in particular? A: What I can tell you at the moment is that the two presidents will exchange views on the bilateral relationship as well as major international and regional issues of common interest. As for what specific issues will be on the top of their agenda, the information will be released in due course. Q: First, with regard to President Xi's visit to Florida, can you tell us whether there has been any concern on the Chinese side that this summit would not occur at the White House but the Mar-a-Lago estate, and therefore has not been characterized as a state visit. Second, we understand that China has agreed not to further pursue the Myitsone dam project in Myanmar. Can you confirm whether it is true? If so, why? A: On your first question, President Trump has announced Mar-a-Lago the "winter White House" after assuming the post. To host the presidential meeting at this place shows the importance attached by the US to this meeting. The Chinese side respects the arrangement by the US. Both sides attach great importance to the meeting and are actively preparing for it. It is believed that the meeting will chart the course for the development of China-US relations in the new era, push for the sound and steady growth of the bilateral relationship from a new starting point and promote peace, stability and prosperity in the Asia-Pacific and the world at large. On your second question, China and Myanmar are friendly neighbors, and it serves their common interests to carry out mutually beneficial cooperation. The Myitsone hydropower station is a commercial cooperation project that has gone through the whole examination and approval procedures. We will stay in communication with the Myanmar side to properly address problems and difficulties in the process of cooperation and sustain the sound development of bilateral cooperation, so as to deliver more benefit to the two peoples. Q: First, given that the US and the ROK continue with their military exercises and the DPRK keeps testing its missiles despite the fact that China lately put forward the "suspension-for-suspension" approach, does that mean that the proposal is a failure now? Second, will Chinese and US presidents touch upon the issue of THAAD during their meeting? A: I cannot agree with you that the "suspension-for-suspension" approach is a failure just because it is yet to be accepted by relevant parties. I believe it shows once again that the Chinese side has worked hard and tirelessly for denuclearization, peace and stability of the Korean Peninsula. The Chinese side has been stressing that the issue of the Korean Peninsula is a deep-rooted and complex one. In order to resolve it fundamentally, we need to address both its symptoms and root cause, and take into account all parities' legitimate security concerns. We need to find a way to denuclearize the Korean Peninsula and peacefully resolve the nuclear issue of the Peninsula so as to realize enduring peace and stability of Northeast Asia. The Chinese side has been promoting peace talks. With different parties' concerns and the crux of the Korean Peninsula issue in mind, we proposed to pursue in parallel tracks denuclearization and the replacement of the Korean armistice with a peace agreement, and called on the DPRK to suspend its nuclear and missile programs in exchange for a halt of the large-scale US-ROK exercises. The purpose is to bring all parties back to the right track of peacefully resolving the nuclear issue of the Korean Peninsula through dialogue. We hope that all parties will give us a positive response and work together to play a positive and constructive role in realizing denuclearization and safeguarding peace and stability of the Peninsula. On the issue of THAAD, the Chinese side has repeatedly stated its opposition. This stance will not change.